Just FIRE'd and need to get HI coverage for DW, DD1, DD2 and myself (all used to have megacorp coverage until a few days ago). My question, generally, how is the PPACA "supposed to" work in this case, because my experience so far with healthcare.gov has left me scratching my head. I thought I could put in all 4 of us, it would tell me what the subsidy amount was, I'd pick a plan, make the first month's payment, and be done. But it seems to want to split-off the kids in various ways. That would have been too easy. No, the process apparently involves the older of the two daughters filling out her own separate application. And the younger of the two got snagged in Medicaid somehow! Some facts, in case these are important for the discussion. After completing the application, it said "You told us someone on your application files their own tax return. Please call us...". And now I understand that I was supposed to call BEFORE I did the application and talk to someone...maybe they would supply a slight of hand technique to get through the application? The second problem is that the younger of the two has been flagged for Medicaid. I'm not even sure what that means except that it doesn't sound like what I had in mind. I called and talked to someone at healthcare.gov and they said it was because of her age and income (18 and $0). I asked 'even though she's a dependent?' and got a verbatim repeat of age/income. The question is, are college students just supposed to get separated from their parents' policies under PPACA? Because that seems to be the way I've been driven on my first pass through. I'm sure I'm not the first one to run into this. What have others done? There is the possibility of just buying the health insurance coverage offered by the universities, but I didn't sign the kids up for that since I was employed and had insurance for them at the start of the semester. I'm not sure you can start using that insurance 'on demand'. If you have any experience in this realm or ideas, I'd like to hear them! Sengsational, the way the ACA is designed you have two options. The first is to get coverage for all 4 of you on one policy, the second option is to get coverage for 3, and your 22 year old daughter gets her own policy. You can choose either of these. Not all policies offer the same geographic coverage, so you need to identify options that have adequate network coverage where your daughter lives or plans to relocate. This may result in a more costly policy. 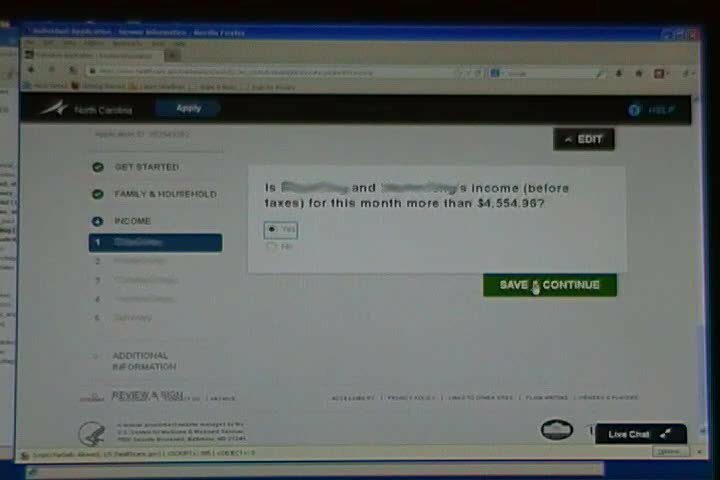 You will also need to include her income to determine your eligibility for premium assistance. Assuming you are eligible, the tax credit is based on a lower cost policy (2nd lowest silver level plan). If you need a higher cost plan that covers your daughter’s remote location, the additional cost is not eligible for premium assistance. Your younger daughter is eligible for coverage in your family plan, and the folks you are dealing with are probably a bit overworked and slightly confused. I would suggest you first do the math and decide if you want your oldest daughter on your policy or not. Once you make that choice, then call the exchange to delete your previous application and submit a new one that is geared toward the choice you have already made. Thanks MichaelB. Sounds like good advice. My plan was to put all 4 of on a BCBS of NC policy, even though I know the older daughter will not be a dependent on 2014 taxes. Then in July, when she gets corporate coverage, run a life event change and drop down to 3 getting covered. So although I went into using the web site knowing where I wanted to go, I ended-up in the weeds. There are some local agents that were promoted by BCBS NC that offered to help people negotiate the enrollment process (for no additional charge...so they must get a kick back), so I might go that route. I'll update the thread as things progress. That's a reasonable approach, no reason it shouldn't work. The second pass we raised my income, getting the 18yo out of medicaid, but the 22yo was still on her own. The third pass probably would have worked, but the system threw an error screen at the point when it was chewing on the income numbers. At that point, the agent suspected that my ID had "too many attempts", and so wasn't going to work any more. He suggested we start from scratch with my wife as the primary. Since I couldn't complete the email loop for my wife (don't have cloud-based email), we quit, but since we did spend almost 2 hours, I'm entering his code on any later applications that I do. One bit of advice that the rep had that made sense to me was that you've got to look at students not as what you think might happen in 2014 (like getting a job), but only up until the "life event". So since someone who only makes pocket change money, like the 22yo, you don't need to file a tax return. So that's how we solved that problem...just said as it stands right now, a student only making pocket change, no tax return is going to be filed. The other thing I learned is about the Medicaid snagging point. The agent was saying that it was at the level of 250% FPL. Does that make sense to the readers here? That doesn't align with what I've gleaned. Not that the rest of the family gets snagged there, but the 18 year old has been snagged every time with income levels up to 49K for a household of 3 or 4. I'm thinking that no matter what income I put in there, the 18 year old is going to get snagged there, and I'll need a letter of denial from the state and then (somehow) get her onto my policy. Sure would be nice to find someone who's been through this and could offer some advice! The Medicaid cut off is 138% of FPL. The cut off for a family of 3 is $27K and family 4 is $32.5K. Thanks. That aligns exactly with what I thought. But I put $49K income into healthcare.gov for a family of 4. But when I looked at the 'Eligibilty Results' PDF that comes out at the end of the application, there was a problem. The PDF lists all the people on the application, and a status. I found "Eligible for a tax credit..." status for me, my wife and 22 year old daughter. But the 18 year old's status said "May be eligible for Medicaid". And when I clicked to buy insurance, it only had three people (the 18 year old had been cut out). If the table above tells you that your or any of your family members are or may be eligible for Medicaid or NC Health Choice, the state agency will contact you with more information about your health benefits, services and how much you pay for them. If you don't hear from them, call them at the phone number listed in the section, "Where can I find more information?" I haven't called them yet, but after having looked at the Medicaid qualifications for kids, we won't qualify, by a long-shot on both income and assets. That would mean I would need to get the NC Medicaid people to generate a letter that denies Medicaid. That letter would need to somehow get to the federal marketplace people, and the marketplace people would need to munge my application to add the 18 year old back into the mix. And all that would have to be done in two weeks. I have very little confidence in that getting done that "fast". If I knew the income number to enter that would keep the 18 year old from getting snagged, I'd just put that in there (even though I won't be making that much in 2014). After all, it's just for the direct payment subsidy; in April of 2015, when I do my taxes, I'd just get a bigger credit, since that would be based on 'actuals' vs this, which is based on projections. But I don't know what income number to enter! If there were an unlimited number of tries, I could afford the time, but it seems like after a few tries (create then delete an application) with the same ID, they let you put in everything and at the very end, they throw an error at you, and you can't continue with that application. Ah, just gotta love uncle sam! As far as getting the students on the university policy, the fact that they are no longer covered under your old insurance might be a qualifying event which would allow them to enroll at an unusual time of year. That would mean I would need to get the NC Medicaid people to generate a letter that denies Medicaid. That letter would need to somehow get to the federal marketplace people, and the marketplace people would need to munge my application to add the 18 year old back into the mix. And all that would have to be done in two weeks. I have very little confidence in that getting done that "fast". Just got off the phone with a rep from healthcare.gov and he was pretty clear that there IS a process for this. The state Medicaid office needs to release the person snagged by Medicaid and healthcare.gov needs to re-apply the person. The ability of each state Medicaid office to manage the releases is mixed; apparently some states can do it in 1 to 3 days, and others might take 60 days. The re-apply should be trivial/immediate if the release makes it back to healthcare.gov. The alternative would be for the Medicare 'snagee' to do a separate one-person application on the phone with the marketplace (said on the phone would be faster/better/fewer problems than the web site). I was concerned that this alternative would result in different costs and policies as compared to the release/re-apply, but the rep seemed to think that the two would end-up being the same. I plan to call the state Medicaid office on Monday and see if they even know where to find the list that comes from healthcare.gov, hehe. Just got off the phone with a rep from healthcare.gov and he was pretty clear that there IS a process for this. The state Medicaid office needs to release the person snagged by Medicaid and healthcare.gov needs to re-apply the person. When I called my state/local Medicaid people, their recording indicated that they haven't even received any data at all from the healthcare marketplace and it will take months for them to filter through all of the applications whenever they do get them. Then I thought I might apply and get rejected through a separate process, but even that takes 45 days. Finally Got All My Kids In One Group Policy! 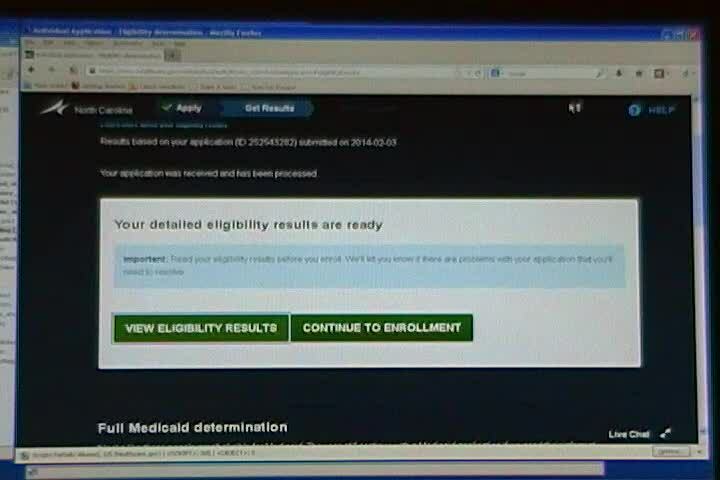 So I again raised the income I was entering into the healthcare.gov site until it finally didn't snag my daughter in medicaid. I'm not sure what significance $4,554.96 has, but it doesn't seem that it's based on the income I put in ($59,000). It might be something to do with a family of 4 and FPL, but that's roughly 232% of FPL, which is a totally out of the blue number, as far as I can tell. As an aside, I'll note that I had to abandon my original healthcare.gov user id because it just whacky with the questions it was asking. At first, it would let me go through an entire application, then fail at the end. Later, it would start getting strange earlier in the process (had my one daughter on there twice). But it was a relief to see this screen with the CONTINUE TO ENROLLMENT button and the PDF that had all 4 of us in the table, each without any notes on having to go off and find a different way to get covered. I am glad that this eventually worked out for you. Hope the rest of the steps are smooth so you and your family will be covered. I am watching this with interest. I too have 2 college kids and plan to go thru the same process around October, 2014 when I plan to RE. Remove an Application: If you’ve gotten stuck, have seen a series of error messages, or need to make changes to information you entered, you can remove an application and start a new one. You can do this from the “My Applications and Coverage” page. Sounds like you have worked around the issue.